Unitor™ DieselPower™ Mar 71 is a specially designed liquid biocide against micro organisms contaminating fuel storage tanks and systems. It’s essential to have adequate storage for marine fuel. But microorganisms can corrode fuel storage tanks and systems, leading to clogged filters and nozzles, and degraded fuel. 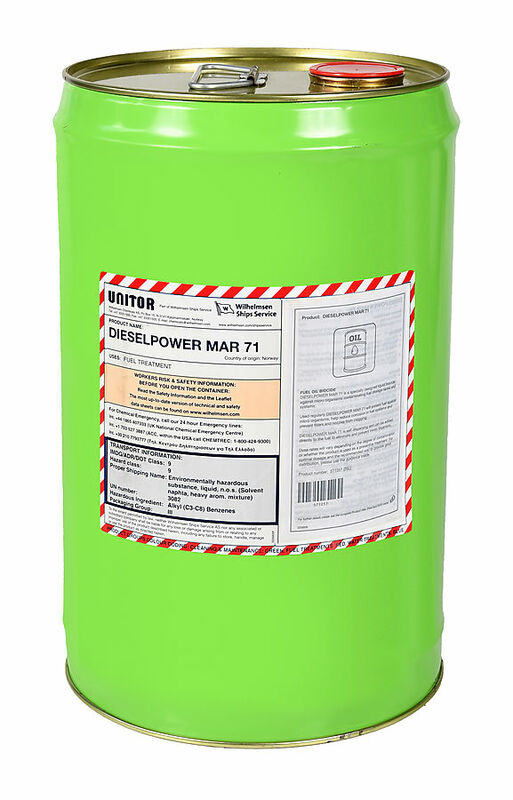 Unitor DieselPower MAR 71 is a specially designed liquid that protects fuel against micoorganisms. More advice on how to detect and manage microbial contamination can be found in ASTM D6469-14 Standard guide for Microbial contamination in fuels and fuel systems. DieselPower MAR 71 is self dispersing and can therefore be added directly to the fuel tank. 0.6 litres/ton in periodic dosing to the tank every 2 months, independent of how much fuel that has passed through the tank. The tank or system layout to treat has an impact on how fast the kill rate is, for Shock treatment we recommend at least 24 hrs treatment time. By pumping the fuel with DieselPower MAR 71 from one tank to another (and back). By adding DieselPower MAR 71 when the tank is one third full and then fill up the tank with fuel. This creates turbulence in the tank and also provides good mixing of the biocide.